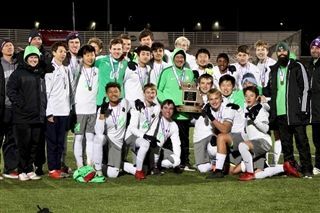 The Barstow boys soccer team traveled to Fenton, MO November 9 & 10 to compete in the Missouri Class 1 State Soccer Tournament. 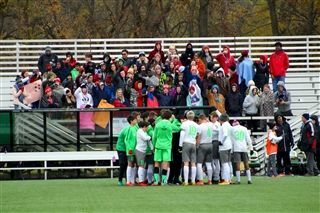 The semi final game was played on Friday, Nov. 9 at 2PM vs Lutheran North. Approximately 75 students traveled on spirit buses to cheer on the Knights. The boys won 4-2, moving on to the championship game. 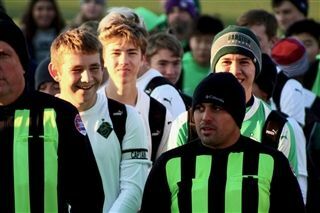 The State Championship game was played at 4PM on Saturday, Nov. 10. They played Principia out of St. Louis. The game was tie at 2-2 at the end of regulation time. They were now going into overtime and the "golden goal" format - first team to score wins. Nearly 3 hours after the game began they went into penalty kicks. The Knights finished the game off with a win in penalty kicks thanks to two saves by Barstow's goalie Luke Lopatofsky. The winning PK was scored by Quinn VanDyke. 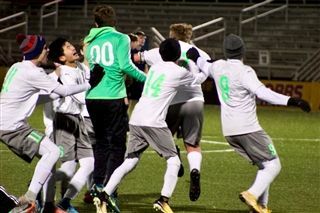 The Barstow boys soccer team will be playing for a Missouri state high school championship on Saturday. 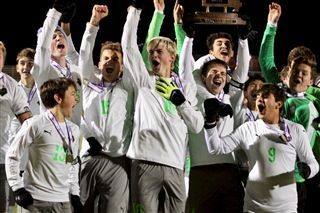 Barstow defeated Lutheran North 4-2 Friday in the Class 1 state semifinals at the World Wide Technology Soccer Park in Fenton. Coach Scott Huppe’s Knights will play Principia, a semifinal victor over Fair Grove, for the title at 4 p.m. on Saturday. 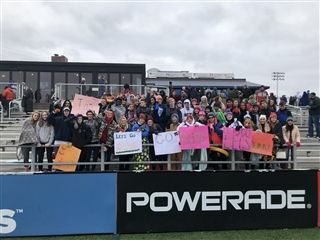 In Friday’s Class 2 semifinals, also at Fenton, Pembroke Hill lost 1-0 to St. Charles West and will play for third place Saturday at 10 a.m. against Monet. St. Charles West and John Burroughs will compete for the Class 2 championship at 2 p.m. The Missouri Class 3 and 4 state tournament games, semifinals and finals, take place next week in Fenton, on Nov. 16-17. 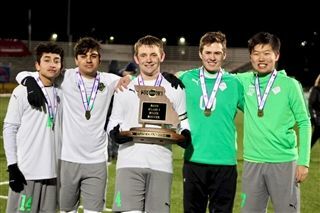 Missouri’s smallest high school soccer classification produced a classic Kansas City-vs.-St. Louis showdown on Saturday in Fenton. The Knights scored first in regulation on a goal from Demir Capan, but Principia tied it before the break. Cayden Williams scored after intermission to put Barstow ahead 2-1, but Principia equalized with 21 minutes remaining in the game. And that’s where things stood entering overtime. Eighty minutes of regulation plus a full overtime period wasn’t enough to decide a winner Saturday. Not even a second overtime, utilizing the “golden goal” format — wherein the first team to score would win — could finish it. The teams were still tied 2-2. So nearly three hours after the game began, they went to penalty kicks. Principia missed its second and fourth attempts. Barstow (11-7) made all four, with Quinn VanDyke hitting the winner. 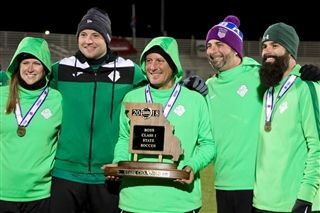 When it was over, Barstow had beaten Principia via penalty kicks to be crowned state champion for 2018 at Worldwide Technology Soccer Park. Barstow last won the state title four years ago. In the Class 2 championship game, John Burroughs beat St. Charles West 3-0. Pembroke Hill, which lost to St. Charles West in Friday’s semifinals, lost 3-0 to Monett in the game for third place Saturday.